A carefully selected range of E-Books Maree has chosen that you can download and read to increase your knowledge on different topics related to Maree's teachings of empowering you to recognise and believe in your own inner leadership abilities. If you are a Professional Service Provider, (or a leader or manager) and highly motivated to advance your career, then this Soft Skills Presentation is for you. The Hard Stuff About Soft Skills – And Why We Need To Take Them Seriously was a presentation given by Maree to the Geelong Branch of CPA Australia. Its message, however, is very relevant to all professional service providers, not just accountants, and to leaders and managers in general. Accountants were becoming aware that technical skills and professional qualifications were no longer enough to make them trusted advisers for their clients. Alone they would no longer produce the outcomes they wanted or the success they desired. They were realising that there was a skills gap that they needed to fill. They needed to move forward and fill that gap by investing in the development of their Soft Skills – the communication, people, interpersonal and self-leadership skills. Accountants are first and foremost service professionals and these all important Soft Skills are essential and integral to them building unparalleled relationships of trust with their people and their clients that really make a difference and set them apart as providers of professional services. 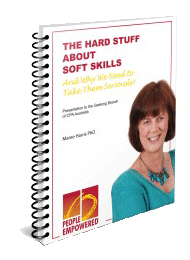 This Hard Stuff About Soft Skills presentation addresses many of the issues that challenge all professionals, leaders, and managers for whom these skills are not well-developed and offers ways they can be managed. It also offers ways that individual professionals, as well as the organisations that employ them, can begin to develop and enhance their Soft Skills and self-leadership skills. The audio transcript of this resource is available here. You will be added to my mailing list so you can be kept informed of other free gifts and programs as they become available. You will also receive my latest blog posts. In December every year Gihan Perera brings together a group of experts in personal and professional development and invites them to write an article that may inspire people in the new year. Maree has contributed to these books since 2009.